Authorities are examining a suspicious package addressed to actor Robert DeNiro at the building where his company Tribeca Productions is located. Also Thursday, two suspicious packages addressed to former Vice President Joe Biden were found in Delaware, law enforcement officials said. With Thursday's discoveries, at least 10 suspicious packages, all similar in appearance, have been found this week addressed to eight people who are prominent Democrats or high-profile critics of Donald Trump. The package addressed to De Niro, found on the seventh floor of 375 Greenwich St. in New York City's Tribeca neighborhood, was reported to police around 4:45 a.m. The building contains Tribeca Enterprises -- which includes De Niro's Tribeca Productions film and television company and organizes the Tribeca Film Festival -- and De Niro's Tribeca Grill restaurant. The package was received in the building's general mailroom on Wednesday, according to a law enforcement official. A retired police officer discovered the package, but initially didn't think anything of it and left it in his office. After watching news reports, he recognized similarities between the package he had seen and the others sent to top Democrats and CNN, the official said. He called police early Thursday morning to inform them about it. Police have sent the package to a secure facility in the Bronx, New York Police Department Commissioner James O'Neill said on Twitter. "The most highly trained experts in the world are investigating today's suspicious package in #TriBeCa," O'Neill's tweet reads. X-ray images show that the package addressed to De Niro contains a device similar to the pipe bombs found in other packages this week that were addressed to prominent Democrats, the two sources said. De Niro is a vocal critic of Trump. Before the De Niro and Biden packages were in police custody Thursday, authorities said seven pipe bombs stashed in manila envelopes were discovered this week addressed to six prominent Trump critics: Former President Barack Obama; former Secretary of State Hillary Clinton; former Attorney General Eric Holder; Democratic US Rep. Maxine Waters (one to her California office and one to her office in Washington); former CIA director John Brennan (sent to CNN's New York offices); and billionaire investor and Democratic donor George Soros. Most of those devices showed the presence of a sulfur substance, which could have exploded, a law enforcement official said. Those devices are believed to be pipe bombs, inherently unstable, and at risk of being set off just by handling. Details about how authorities ultimately found the two Biden packages on Thursday morning in Delaware weren't immediately available. But Delaware authorities have said investigators have responded to post offices in Wilmington and New Castle. The FBI said Thursday that the package addressed to De Niro and the two addressed to Biden were "similar in appearance to the others." Tribeca Enterprises co-founder Jane Rosenthal said Thursday that the building was evacuated after the package was found, but that it has been re-opened. "The building is open and everybody is safe," she told CNN. "This is not what free speech should look like." At June's Tony Awards, De Niro went off-script while introducing a performance by Bruce Springsteen to curse Trump. "First, I wanna say, 'f**k Trump,'" De Niro said. "It's no longer 'Down with Trump,' it's 'f**k Trump.'" Trump responded to the comments in a series of tweets, calling De Niro "a very low IQ individual." It wasn't the first time De Niro had spoken out against the President. 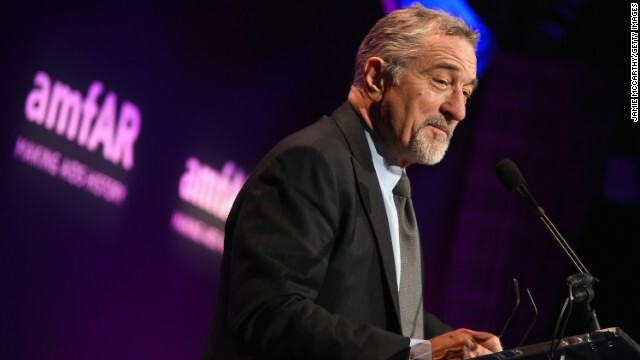 "Our baby-in-chief -- the j***-off-in-chief, I call him -- has put the press under siege, ridiculing it and trying to discredit it through outrageous attacks and lies," De Niro said. ""This f***ing idiot is the President. It's 'The Emperor's New Clothes' -- the guy is a f***ing fool ... our baby-in-chief -- the 'J******-in-chief' I call him."